The threat of scarcity often leads to a run on products -- such as guns, with sales typically spiking when there's talk of tightening regulations after mass shootings. And that appears to be the case for the Confederate flag, now under assault in the aftermath of the murder of nine worshippers at Emanuel African Methodist Episcopal Church in Charleston. Dylann Roof, the alleged murderer, posted several pictures of himself online with a Confederate flag and white supremacist symbols, stoking furor around a flag that has long been controversial. Many politicians who had defended the right of southern states to fly the flag changed their minds and said it should be relegated to museums. Leading retailers including Walmart (WMT), Amazon (AMZN), Sears (SHLD) and eBay (EBAY) have now said they'll stop selling Confederate flag merchandise. But that follows a spike in sales that caught retailers off gaurd. On Monday, before Haley announced her change in position on the flag (which still must be approved by the state assembly), Amazon showed just two Confederate flags among the 60 bestselling items under “Outdoor Flags and Banners”: one at the No. 5 spot, and one at No. 43. The following morning, five of the top 20 bestsellers in the category were Confederate flags, including the No. 1 bestseller, a 3-by-5 foot polyester model made by Rhode Island Novelty and sold by a company called Anley. Among the top 60, 12 were versions of the Confederate flag. Alotta’s flag, a 3-by-5 nylon embroidered model that sells for $13.95 plus $6.25 shipping (and is not eligible for Amazon’s free-shipping service, Prime) was the No. 7 bestseller as of midday Tuesday. So the sales spike for higher-ranking flags has probably been even greater than for Alotta’s product. Sellers on eBay (EBAY) experienced a similar surge in interest. At about 10 a.m. EST on Tuesday, a confederate flag listed by a seller named superqualityflags showed 149 sold in the last 24 hours. By 11 a.m., 201 had been sold in the last 24 hours. EBay announced its ban on Confederate flag sales a short while after that, saying "we believe it has become a contemporary symbol of divisiveness and racism." Amazon didn't respond for this article, but it announced its own ban about two hours after eBay did. 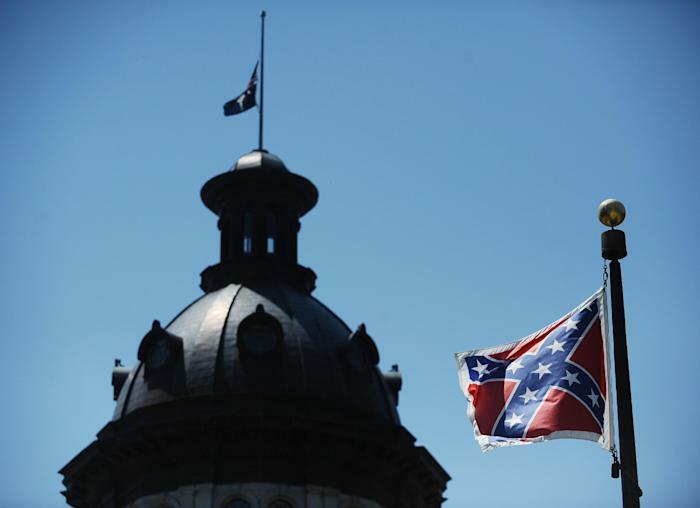 Civil rights advocates may be disheartened by the sudden interest in the flag, which some interpret as a show of solidarity with Roof and other white supremacists. But southerners often point out that pride in the stars and bars has nothing to do with racism. Instead, for many, it signifies respect for the Confederate soldiers who fought for their homeland during the Civil War, including hundreds of thousands who perished. “Wrap yourself in it first,” another user replied. Even with a spike in sales, some flag manufacturers are deciding that dealing with Confederate products isn’t worth the trouble. “We have decided we’re not going to be participating in producing the Confederate battle flag anymore,” Reggie Vandenbosch of Valley Forge Flag Co. of Wyomissing, Pa., told Yahoo Finance. “There’s always been discomfort with it, and this tragedy is one of those sea change moments.” Valley Forge is one of the largest flag makers in the nation, and Vandenbosch is president of the industry’s trade group, the Flag Manufacturers Association of America, so other domestic flag makers could follow suit. That doesn’t mean Confederate flags will disappear. Many are made in China, where there’s likely to be no pressure on manufacturers to suspend production. (If a 3-by-5 flag of any variety costs less than $15, it’s a good bet it’s not Made in the USA.) There's no law against selling the flags and it seems unlikely there ever will be. And small business, whether a physical or online storefront, typically face less boycott-style pressure than big national chains like Walmart. Just ask for your Confederate flag discreetly.